Sounds reasonable, even maturely responsible, don’t you think? Problem is that the discretionary activity usually involves some relationship activity that I really should do–something I’ve intended to do; even promised to do. Something I’ve told a friend I would do. Something like making a touch-base phone call; sending a birthday, get well, or some other greeting card; sending an email response, or formalizing and finalizing get-together plans. Regardless of all the good intentions and a lifetime of oft-spoken inspirations, sorry to say, more times than not, the greeting cards stay unsigned, emails unsent; the phone calls remain unmade; the get-together plans do not get together. Hmm…At least I’m in good company; not that St. Paul’s admission excuses my behavior. No. Absolutely not. And, yes, I know that “… the Lord looks at the heart” (1 Samuel 16:7)–the intent; the intentions, but somehow, I’m thinking that without extenuating circumstances or legitimate impediments, I’m not getting partial credit for social obligation promises broken and social obligation responsibilities unfulfilled, no matter how good or genuine my intentions were. Perhaps not quite as bad as breaking promises made in the intended recipient’s hearing, I think, are those charitable intentions made “only” in one’s heart. Although, given that the Lord knows everything we think, feel, say, and do–or not–I think it’s still not a good thing I do to “intend,” even to myself, and then not follow through. What about you? 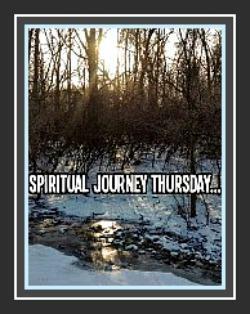 Do you find yourself having similar spiritual journey challenges? If not–or if you’ve overcome them, please advise! Thanks and God bless you! I appreciate your willingness to share this area of your life where you feel you somehow fail… it’s tough being human! I remember someone telling me once, “Don’t TRY. Just do it.” I think about that a lot. It’s about commitment, isn’t it? Maybe it helps to commit less, and actually achieve the things we do commit do, so that confidence can build instead of that awful self-fulfilling prophecy of trying and trying but never doing. Thanks so much for sharing. Keep going! God bless you for taking so much time to share your most welcomed SJT sisterly advice! If I put together what you have said here and what Linda wrote on her post, I think a change–with the help of God’s Grace–is definitely do-able! Thank you! God bless you! I know exactly what you mean. I commit to way more than I can possibly do. I recently promised to crochet baby blankets for family members with the full intention of getting them done before summer. Now, I’m wondering what I was thinking. I agree with Irene that by committing less, I’ll be able to accomplish the things that are really important. Thank you for showing me I’m not alone in this! My sentiments exactly! Yours was the first post I read this morning and I was heartened by your commitment to commit to less and follow through more. We need to pray for each other to do just that! God bless you. Thank you so very much for taking time to read and to share your encouraging response. I wrote a longer comment, and it somehow disappeared. : ) I just want to thank you for letting me know I’m not alone in committing to more than we can do. I think Irene is right when she says it might be better to commit less and then we’ll be able to accomplish the things that are really important. Yes! We’re on the same leg of the journey! …Good news! Your earlier comment did come through. Thank you! I find it very difficult to say “no”. Part of that is that I would very much like to be able to say “yes”. So I do. But there are not many feelings worse than not being able to follow through on a commitment! I, too, am trying to make sure I can follow through on my intentions. 🙂 Thank you for taking time to share your reactions, and for sharing yet another insight! I hadn’t thought about the “yes” factor; I was thinking primarily of commitments I am the one to initiate (even worse)! ..God bless you. We need to pray for each other. Peace! I’ve been there, Bobbie, and often. When I analyze why things get left undone, sometimes I’m surprised by what I see in myself; fear, I doubt my own impulses, it feels like there’s no hurry, or I’m tired, spend a bit of time watching TV and before I know it, the afternoon’s gone!. But the longer I procrastinate, the worse I feel. It’s amazing how helpful it is to do just one of those things. I’m a list junkie and it makes me feel good to cross or check things off my list. Sometimes I write down the things that I’ve done after I’ve done them, just so that I have the pleasure of crossing them off my list. And I must say, if you have this tendency, it sure isn’t evident by your posts for SJT! You’re here, you didn’t procrastinate. Give yourself a high five! Thank you for sharing your experiences; they’re spot on for me, too; I welcome and need those recommended interventions. Making lists is a good thing! …Thank you for your ending affirmation; high fives all around. God bless you, and thank you! Oh my, yes, I’ve definitely fallen short of good intentions. As everyone else has said, Irene’s advice is very wise. Many times I fall short because I’ve overcommitted or because I took on things I didn’t really want to do in the first place. When that happens, joy starts to disappear and guilt sets in. It’s always comforting, though, that scripture shows us we are not alone in our shortcomings. Thank God for grace! Amen! And thank God for the Grace He dispenses to us through each other on SJT. Thank you for taking time to read and to share your encouragement and wisdom! God bless you! I also get stuck with wanting to do more than time allows. Good intentions sometimes go by the wayside and then we feel regret. So let’s all make a pact to to have a doable day with doable intentions. Just this morning, I had to disregard my plans to go to yoga because of two other commitments that would mean I would be on skates trying to get everything done. Hats off to the sisterhood. AMEN!!!! …SJT is a blessing beyond telling! Thank you for your continued encouragement and your gentle/no-nonsense advice and inspiration. Every blessing!